Dental veneers are wafer-thin, custom-made shells of tooth-colored materials designed to cover the front surface of teeth to improve your appearance. These shells are bonded to the front of the teeth changing their color, shape, size or length. -Indirect/porcelain veneers: These are thin shells of porcelain fabricated in the lab, which are then bonded on to the front surface of the teeth to improve the looks. They have a long life and look ver natural. -Direct/composite veneers: It’s a chair side procedure where in the tooth colored filling materials are bonded to front surfaces of the teeth to correct minor cosmetic defects. Only disadvantage is the longevity of veneers, which is not as long as porcelain veneers. 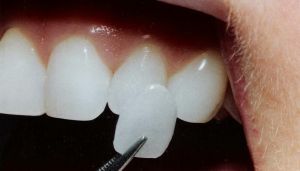 However, direct veneers are cost effective and less time consuming.